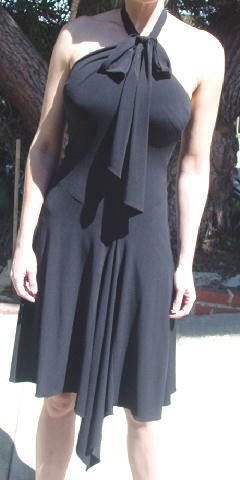 This black synthetic halter style dress is a Laundry by Shelli Segal. The 3/4" to 1" wide neck strap is 7 3/4" long on one side and 6 1/4" long on the other, and they are attached by two eyehooks. The sides each have a 6 1/2" long stay. Attached at the base of the halter straps is a large fabric bow. The off-center longer front panel is 9" longer than the bottom side hem. The full lining is 2 1/2" shorter than the dress hem bottom. The back has a 13 1/4" zipper and top eyehook closure. The tag says size 2. She wore it to a club opening. armpit to bottom side hem 32"